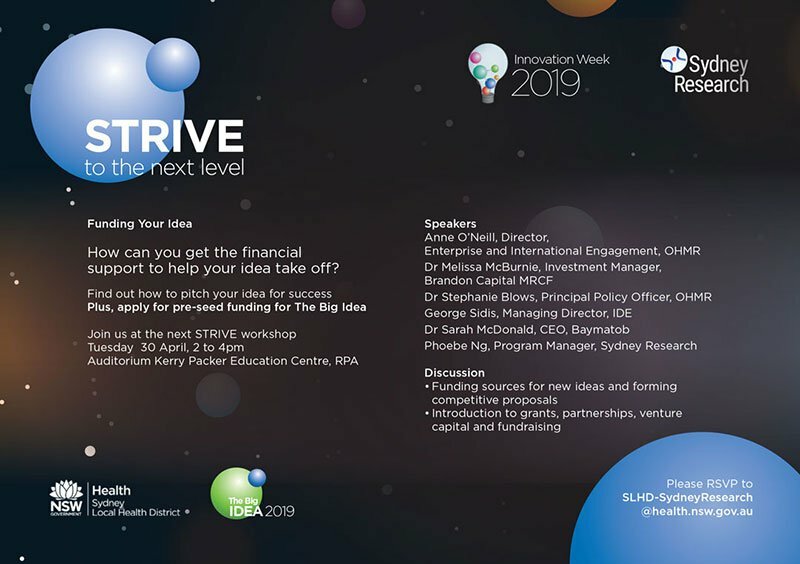 The STRIVE Research Impact and Commercialisation Series by Sydney Research is a series of workshops promoting the understanding of the research investment and commercialisation process. It will help you understand core concepts and develop the skills and knowledge that you need to take your research to the next level along the commercialisation pathway and attract long-term, recurring funding for your work with government, community, and industry partners. At each session you will hear from leaders with years of experience in research, industry engagement, intellectual property, research and development, innovation management, commercialisation and more. You will also have the chance to network with your peers and foster relationships with likeminded innovators and world-class research leaders. This series should be attended by researchers, healthcare workers, scientists and students with an interest in deepening their relationships with industry for research and development funding and research commercialisation, or have an idea or research project that could be transformed into a commercial prospect with patient impact.